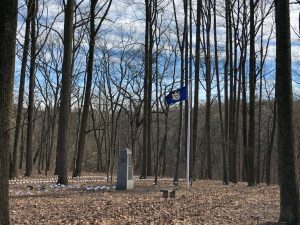 During 2019, Freedoms Foundation and the Friends of the Medal of Honor Grove are paying tribute to the living recipients of the Medal of Honor on the anniversary of the actions for which they earned the nation’s highest award for valor. The series continues with a look at Sgt. Gary B. Beikirch of the 5th Special Forces Group, whose unit came under attack on April 1, 1970 by North Vietnamese forces at Camp Dak Seang in Kontum Provice, South Vietnam. “For conspicuous gallantry and intrepidity in action at the risk of his life above and beyond the call of duty. Sgt. Beikirch, medical aidman, Detachment B-24, Company B, distinguished himself during the defense of Camp Dak Seang. “The allied defenders suffered a number of casualties as a result of an intense, devastating attack launched by the enemy from well-concealed positions surrounding the camp. Sgt. Beikirch, with complete disregard for his personal safety, moved unhesitatingly through the withering enemy fire to his fallen comrades, applied first aid to their wounds and assisted them to the medical aid station. “When informed that a seriously injured American officer was lying in an exposed position, Sgt. Beikirch ran immediately through the hail of fire. Although he was wounded seriously by fragments from an exploding enemy mortar shell, Sgt. Beikirch carried the officer to a medical aid station. 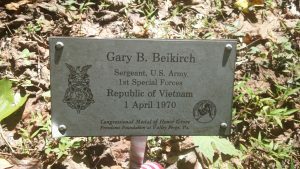 Gary Beikirch is honored in the New York Area of the Medal of Honor Grove. “Ignoring his own serious injuries, Sgt. Beikirch left the relative safety of the medical bunker to search for and evacuate other men who had been injured. He was again wounded as he dragged a critically injured Vietnamese soldier to the medical bunker while simultaneously applying mouth-to-mouth resuscitation to sustain his life. “Sgt. Beikirch again refused treatment and continued his search for other casualties until he collapsed. Only then did he permit himself to be treated. “Some time later, Sergeant Beikirch passed out; he came to in a bomb crater awaiting evacuation by helicopter. He was taken to Pleiku and from there to Japan, and finally to the Valley Forge Medical Cente, where he stayed for six months, slowly relearning to walk. “Released from the Army in August 1971, Beikirch spent a year wandering around the country before experiencing a spiritual rebirth that led him to the White Mountain Seminary in New Hampshire. There, he went to school and lived as a recluse in a cave he discovered while hiking in the rugged country nearby. In the early fall of 1973, while still at the seminary, a letter arrived in his post office box in town, asking him to be at a pay phone on a certain date and time for an important call. When the call came in, the voice on the other end of the line told Beikirch that he was being awarded the Medal of Honor. 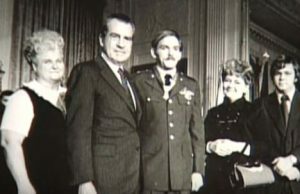 President Richard M. Nixon presented the medal to him on Oct. 15, 1973.